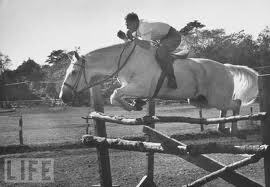 I wonder if there is anyone who rode jumping horses in the 60s that doesn’t know who Snowman was and who Harry Deleyer is. . . Their story is the American dream and anyone who loves to see the under dog win won’t be able to resist them. 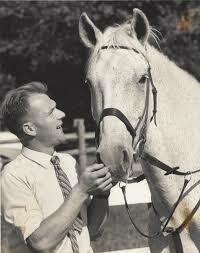 Snowman was the $80 work horse that Dutch immigrant, Harry DeLeyer saved from the slaughter house, and together they became famous in the show jumping world. Growing up as a horse crazy kid on Long Island, Snowman and Harry Deleyer are as much part of my childhood as were Fury and Lassie on TV, or bicycles . I watched them at Local Shows and at Madison Square Garden. My non horse loving Dad used to tell me about his chiropractor who bought a horse from Harry DeLeyer and it kept jumping the fence to return to Harry’s home. That was Snowman. I remember that I used to beg my Dad to allow me to attend Knox School instead of Public School because riding was part of the curriculum at Knox. That’s where Harry taught. People in the horse business on L.I. in those days, jealously guarded their clients and their “secrets” and since I rode with an opposing barn and instructor, I heard things about Harry DeLeyer that were not particularly favorable. And Harry ‘s riding style was so un-orthodoxed that instructors of equitation riders would use it to reinforce the gossip. In fact when I think back to those times, I’m surprised how we were molded by the professionals. I remember when Snowman was relegated to visiting local libraries to promote a childrens book, “Snowman” by Rutherford Montgomery. And then Snowman and Harry DeLeyer faded into my past. In 2010 Elizabeth Letts published The Eighty-Dollar Champion: Snowman, The Horse That Inspired a Nation. A few months ago I gave it a read. It was a nostalgic experience for me, kind of like taking a trip back to my childhood. It brought back memories of another place and other times. I’d forgotten how different the horse world was in the 60s. Like the proverbial frog in the pan of hot water, I’d changed with the changes and didn’t even realize it. The book talks about Harry’s back ground during the war, something I’d not thought of. My generation was more concerned with Viet Nam. But it gave me a new respect for Harry DeLeyer. And it talked about how hard it was for someone like Harry DeLeyer to be accepted in the social circles of Long Island. That I knew was true. But I felt the book leaned heavily on the “Poor Harry” side and made him appear a sappy, whiner. Personally, I think Harry DeLeyer was a lot tougher than Elizabeth Letts portrayed him and when I looked at the articles and research she used, it was easy to see why. Most of it was biased towards the poor Harry story. But then, I’ve already admitted to being a little jaded. But there is so much truth and so much history in “The Eighty-Dollar Champion”, that I’d read it again. I’d probably read it anytime I wanted a trip down memory lane. Regardless of how it’s written, the story of Snowman and Harry DeLeyer is special. The poor hardworking immigrant saves the horse that would be dog food and they become successful and famous…well it’s true and it’s an amazing, wonderful real life story, the kind that makes you believe in the impossible. I’ve shared some of the video of Snowman, so you can see for yourself. And Harry DeLeyer? 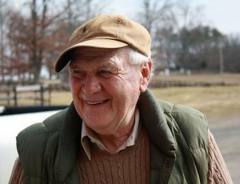 The last I heard he’s still teaching riding at Nederland Farm in Dyke, VA. He’s 85 years old. Oh and just for the record. . .I thought Snowman was beautiful! Thanks for reading U.S. Horsemanship !